In a couple of days, I will board the plane and fly to the largest Microsoft Conference in the world – Microsoft Ignite 2018. I am very happy to travel to Microsoft Ignite 2018 in Orlando this year. 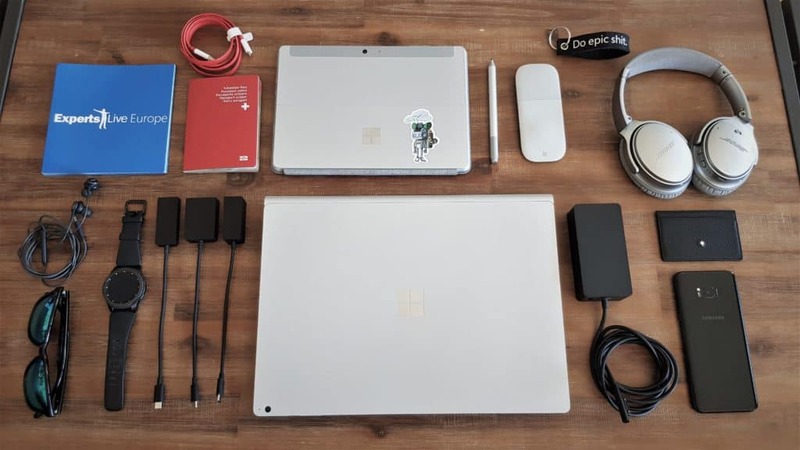 In this blog, I will quickly share with you what I pack in my bag for Microsoft Ignite. Microsoft Ignite is an annual conference for developers and IT professionals hosted by Microsoft. You can get the latest insights and skills from technology leaders and practitioners shaping the future of cloud, data, business intelligence, teamwork, and productivity. I am really looking forward to it and meet other enthusiasts around Microsoft Cloud solutions. And of course, to connect and meet with members of the Microsoft Product Groups. In the last couple of days, I am already preparing for the event. Besides checking out sessions and preparing side meetings, I am also packing my bag. One of the most important things for larger conferences like Ignite, is that you pack light. The conferences venue is huge, and your sessions and meetings maybe spread over the whole venue. You will walk a lot. It is important that you have good and comfortable shoes and save weight as much as possible, when packing your bag. And this is what I try this time. My main devices this year will be the Microsoft Surface Go. Next to it being a notebook, tablet and desktop replacement, it is very lightweight and small but still comes with a full Windows 10. This makes it a great device to carry it around the conference. And with OneNote it should be great to take notes. The Surface Pen, well especially for conferences, workshops and trainings, I like to take handwritten notes or draw things to discuss ideas and solutions with people. Since I will do some serious work before and after Ignite, I will bring my Surface Book 2. The main reason for this, is the screen size. When I am working a couple of hours, a little bit more screen real estate helps a lot. The Bose Quiet Comfort 35 Audio Headphones and their noise cancelling feature is some real lifesaver. I like them especially when I travel and have long flights. But I also like that they now support Bluetooth, so I can connect wirelessly. I am also carrying the Samsung Galaxy Gear S3, which helps me tracks the steps I walk during Microsoft Ignite and the limited sleep I get during this event. Trust me, you will definitely walk a lot during that conference. For presentations I got a Microsoft USB-C to HDMI and VGA adapter. Since the Surface Book 2 and the Surface Go, both use USB-C for external dongle, this makes it simple to just carry one type. I also carry the Microsoft Wireless Display Adapter which acts as a Miracast Receiver and is great for presentations. USB 3.0 drive, since you never know when you need to share some files, which might be too large to share over the conference Wi-Fi. Flyers for Experts Live Europe 2018, which will be held in Prague this year, and where I will present two sessions. I just use power adapter of the Microsoft Surface Book 2, which can power the Surface Go and the Surface Book 2. It also has a USB port for charging the phone, speaker and other stuff. All the best Thomas. Bring back a lot of “goodies” for us.